Accessed in Appearance → Customize → General settings → Social settings. Here you provide links to social profiles that you have. 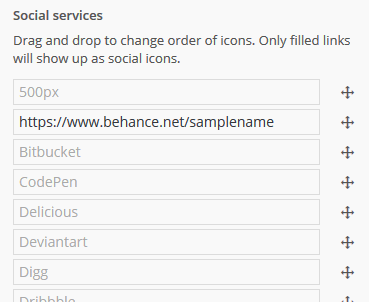 What you set here will be displayed in the Apollo13 Social Icons widget and other layout places(header, footer) that allow displaying socials icons. You can drag & drop social items to set them in the order you wish to see on your page.